Prepare a batch of elegant looking Asparagus Appetizers. 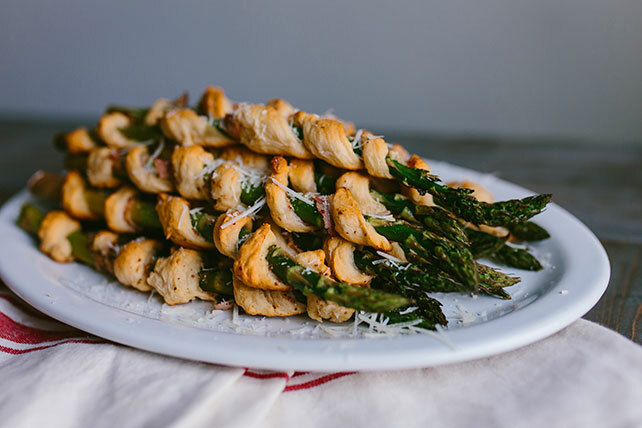 These Asparagus Appetizers are a winning combination of ham, asparagus and dinner roll dough. Unroll dough on work surface; firmly press perforations together to form 12x14-inch rectangle. Spread with mustard; top evenly with ham. Cut dough crosswise into 16 strips. Wrap 1 strip, in spiral fashion, around each asparagus spear; place on parchment-covered baking sheet. Bake 20 min. or until asparagus is crisp-tender and dough is lightly browned. Sprinkle with cheese. The asparagus spears can be wrapped with prepared dough strips as directed ahead of time. Refrigerate up to 4 hours before baking as directed.